Greco finds its highest expression in the Greco di Tufo wines from the town and Campania-region appellation of Tufo. The grape is of ancient heritage, having come into Italy over two and a half millennia ago; it was described (and praised) by eminent writers from the classical age of Rome, and may have been a component of the famed Falernian wines of that era. There are still arguments running about whether "Greco" is a single grape type (with varying clones) or a catchall name that covers several similar but not identical types. DNA profiling is helping to resolve some of those questions, but the matter is not yet settled (for instance, there is a hot question as to whether Asprinio, often regarded as a minor grape type, is in fact the same thing as Greco—the DNA seems to say as much). In general, one just evaluates all "Greco" wines as if they were from the same grape, though, again, the di Tufo types are very widely held to be clearly superior (either a better clone or a better type, and which is immaterial). 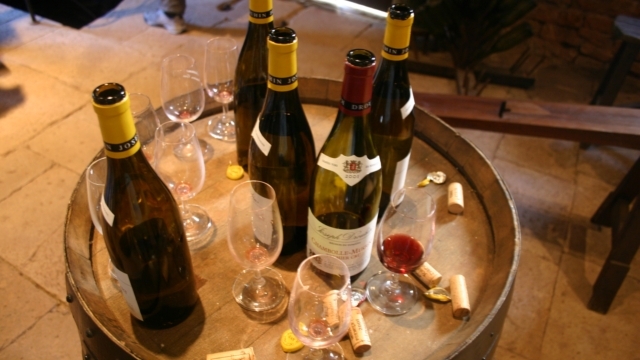 Greco wines are typically relatively deep in color for whites, and have a profound nose (Jancis Robinson has likened it, in a vague way, to Viognier). The taste, however, is not usually fruit-forward; what fruit there is will be stone fruit, notably peach, though some find pomes instead (apples, pears). There is also usually some citrus-y quality, and most especially substantial minerality. Greco usually has medium to high acidity, making it tart and crisp. Better Greco wines can bottle-age to advantage, and acquire herbal overtones as they do, though there is always a risk of eventual over-oxidation and ruination of the wine. Greco is one of a trio of white wines that distinguish the Campania region: Greco di Tufo, Fiano, and Falanghina. As a rough rule of thumb, a vintner who is good at any of those will be good at all of them, and a few notable houses tend to dominate regional production. Factoid: The name "di Tufo" derives from the regions soils, which are "tuff", a rock type originating in volcanic ash; such ash, where found, significantly affects the flavor of grapes grown in it. "Greco bianco wines are noted for their aromatic qualities which some wine experts, such as Jancis Robinson, describing the wines as being vaguely similar to Viognier. Some aromas commonly associated with the grape include peaches and fresh green foliage. With age, Greco wines can develop more herbal notes." "Armed with excellent acidity and a fresh, clean, grapey flavor profile, Greco wines are best consumed young. They tend to oxidize in bottle relatively quickly (within just a few years of vintage), resulting in nutty, caramelized flavors." 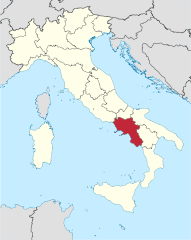 "Greco is most famously grown in the province of Avellino - historically known as Irpinia- located inland some 30 miles east of Napoli and the sea. In and around the town of Tufo - named for the tufaceous soil - the wine is known as Greco di Tufo. This is a dry white with aromas of lemon and pear with notes of almond and a light minerality in the finish. Many Campanian wines - both white and red - are decribed as having mineral flavors, which is due in large parts to the local soils, many of which have been altered by deposits of lava from Mount Vesuvius over the centuries." "This is not a mild wine, it is full of personality, and is said to compensate for the gentle nature of the inhabitants of the Irpinia (the mountains that encompass the region) who transformed this hard land with attention and love. Greco di Tufo is truly a particular white wine. Its personality and flavor make it a perfect choice for delicate foods, such as appetizers and fish with butter or white sauces and just as appropriate with quality roasts and medium structured meats." "Greco di Tufo and Fiano di Avellino grow in the hills around the city of Avellino. Greco often exhibits a strong minerality in addition to its racy fruit. . . Falanghina, Greco di Tufo and Fiano di Avellino generally are drunk young, but some bottles can age." "Cultivated in the volcanic hills of the Avellino Province, the grapes that go into Greco di Tufo are exposed to a climate that enables them to retain acidity as they ripen. The rich volcanic soil gives the resulting wine its complexity and mineral quality. It also yields notes of citrus, pear and toasted almonds. Only eight villages in the Compania region are legally allowed to call their wine Greco di Tufo and these wines must contain a minimum of 85 percent Greco di Tufo grapes. Greco di Tufo is a surprisingly robust alternative to red wine when enjoying some of the Italian classic dishes. Because of its high acidity, it is the perfect match for fresh tomatoes – in sauces, salads, pasta dishes and more. 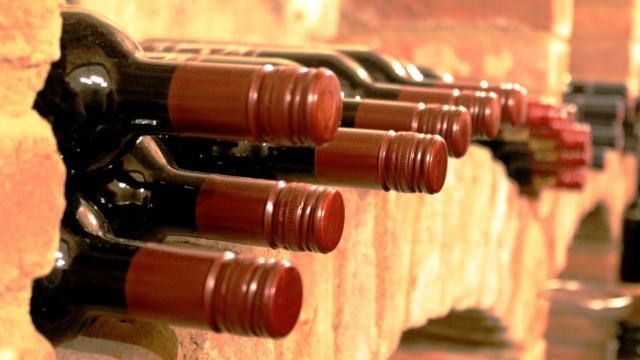 The medium body wine compliments all types of seafood dishes such as shrimp scampi, clams and calamari. "Greco is a fairly neutral grape with few primary aromas. But if you succeed with the challenge to conquer all the difficulties then you get a complex and mineral wine with good structure and high acidity. It is not unusual that the acidity is as high as 10 grams per litre. You can feel it in the teeth after having tasted forty different Greco di Tufo during a morning. There is no tradition of aging the Greco di Tufo wines, although according to me they have the potential for ageing, given the high acidity. This was evident when [in 2013] we tried a Greco di Tufo from 2003 from the Pietracupa winery. It was an amazing wine, elegant with a fresh acidity that was toned down somewhat with the age. Scents of dried apricots and citrus followed by a long mellow taste with tones rich in minerality, yes, simply an amazingly good wine. But it was the only older vintage of Greco di Tufo available to taste during the anteprima so it is hard to put it in context." "Greco di Tufo is a mineral driven wine that reflects the ancient volcanic chain that makes up the soil in this area. It is a clean refreshing wine that needs to be consumed young. These wines need food as they contain a lot of natural acidity and are not high in “fruit” flavors. They have an almond like quality and some background notes of pears. Although historically a sweet wine, they are almost always vinified completely dry and make great pairings with sea food or salads." "As most producers opt not to mature these wines in wood, the aromatic profiles of each stand out, with Greco delivering more lemon and pear aromatics (along with a pleasing note of almond in the nose and the finish) . . . Greco tends to drink best within five years of the vintage date . . . Greco tends to be more reserved with slightly higher acidity (in some cases) as well as having a bit more minerality. These estimates about aging are general of course and it’s always a treat to learn about a Greco or Fiano that shows well more than a decade out." "Greco di Tufo stands out from the rest of the crowd thanks to the unique characteristics of the sulphur and tufa-rich (hence its name), volcanic and clay-laden soils, which lend the wine its perfume, complexity, and minerality. This refreshing and crisp white is known for its beautiful balance, and is also characterized by its aromatic notes of lemons, pears, toasted almonds and lingering, mineral finish. Greco is generally at its best within two to three years of bottling." The Big Three regional producers of the Big Three regional whites are Mastroberardino, Feudi di San Gregorio, and Terredora (a Mastroberardino family spinoff). That is not to say that the other producers, though they are small, family-run operations, are to be discounted. ♦ Color: It was super golden in color but didn’t look that viscous. I expected ripe flavors. Smell: The aroma was much bigger than I thought it was going to be. Peach and honey notes were really prominent and there was a wet rock thing coming out of the glass too. It wasn’t a very complex nose, more straightforward — nice clean aroma. This was going to be good, I expected. Taste: Delicious on its own AND with food. This wine packed a punch for a white. It was peachy, honeyed, and lemony. It even had a little bit of pineapple flavor. There was acid, but it wasn’t overpowering and the sensation of licking a rock came to mind on the finish (i.e., it was minerally). Drink or Down the Sink? Drink. Loved it. ♦ Silky smooth, full-bodied, with smooth peach, apricot and tangerine/citrus aromas and flavors that linger on an elegant, lightly spicy, mineral-laced finish. ♣ Wine Spectator: 30 September 2013, 89 points; Top 100 Wuines of 2011, 90 points (wine #87). ♦ The 2011 Greco di Tufo Loggia della Serra impresses for its energy and pure focus. Smoke, slate, crushed rocks and pears are all layered together in a gorgeous, medium-bodied white. All the elements meld together beautifully in this striking, delineated white. There is an understated intensity on the finish that is hugely appealing. The Loggia della Sera is the most complete and harmonious of Terredora’s 2011 whites. ♦ A zesty white, sporting a creamy edge to the lime, melon, pine and chalk notes, with a smoke-tinged finish. ♦ [C]olored a dark shade of yellow, smelled of pine resin and bitter lemon. The palate focused on mint, basil, and pineapple while the finish was high and long. ♦ This  is a worthy follow up to the excellent 2009 vintage of this wine which featured in the Wines of the Week back in September, and ended up in Wine Spectator's Top 100 of 2011. Some tropical characters give richness at first, balancing the lovely minerality evident, before crisp citrus and apple characters keep it fresh and zingy on the dry finish. As the name suggests, the wines come from the beautiful estate-owned Loggia Della Serra vineyard. Terredora has owned all their grape production since 1994. ♦ [Google-translated from Spanish:] Deep golden yellow with golden highlights, aromatic and well pronounced fruity notes such as apple, peach and citrus with a rich structural complexity. On the palate it is smooth and well balanced, with good acidity and good persistence; also, has great potential. ♦ [A] delicious hazelnut, almond and apple blossom flavour, quite full bodied and intense but with its orange-and-tangerine zest flavours, smoky notes and mineral undertones it is a great greco to match with food. I loved its smooth honeyed finish too. Very classy. "STAR VALUE BUY"
♦ [Google-translated from Italian:] Appearance - Golden yellow. Nose - Open, fresh and intense, frankly sapid and mineral, with mild notes of sulfur mixed with a more sensual feeling of citrus peel and melissa limoncella. Taste & Structure - Round, agitated and very sapid, fresh but not sharpened, oily, aromatic spectrum; the infiltrating drink is at the same time well blended with a hint of mild sweetness; slightly oxidative puffs end up with a discreetly persistent mouth. Rating (82/100) - Race characteristics are well-perceived in this successful specimen of Greco 2014 featured Vadiaperti; excellent for consistency and amalgamation of the components, the aromatic spectrum does not remain overwhelmed, and the set shows even a frankly varietal character, even "didactic", though very pleasing. ♦ The aromatics of a well-made Greco di Tufo are beautiful! Reminsicent of ripe peach and violets The palate does not disappoint but follows the ripe peach and floral with spicy, almost savory notes. It's weighty in your mouth and with a little age, one can almost taste the herbs that grow in the hills around the vines. ♦ [Google-translated from Italian:] It is noticed more for a nose-like abbrive than for its complexity; Citrus fruit and sweet fruit on everything. In the mouth it is fairly fresh, not very wide in the nuances: the center-mouth is supported by a remarkable sapidity that makes it particularly tasty, but soon shuts off on a sulphurous note in a not particularly long final. ♦ The Vadiaperti is a first-rate Greco di Tufo with outstanding balance and distinct minerality. It becomes amazing with time; I tasted a twenty year-old version at the winery and was stunned by its color and freshness. Proof that bigger is not better. ♦ Pale gold colour. Classic sugared almonds aroma coupled with clementine and tarragon. Very perfumed and fresh. Palate is zingy and slightly mineral yet balanced beautifully with some sweet pineapple fruit and chewy texture up front, a little oily saline and a surprising kickback of floral character. ♦ This is not a fruit-driven wine. It's quite savoury, dry and minerally on the palate, with a hint of floral and citrus notes but nothing overt. There's soft acidity and a fresh finish. While it's great chilled on its own, it matches really well with seafood. ♦ Brassy gold with brilliant golden reflections; it's a pretty color. The bouquet is fresh -- no tiredness about it -- but also mature, with considerable minerality and some underlying acidity. On the palate it's full and bright, with elegant minerality and mineral acidity that flow into a long clean savory finish. Quite nice, and once again confirms that many Italian whites are much more ageworthy than people commonly give them credit for. 90 points. ♦ This light white gold wine opens with a light pear like bouquet with a hint of lime. On the palate, this wine is light bodied, balanced, a little crisp, with mineral infused lime like flavors. The finish is dry and subtle. ♦ Intense straw yellow. Fruity bouquet with apricot and peach notes. Smooth, elegant, mineral and full body. ♦ Somewhat neutral nose with apples and minerals. Firm, dry, long, with good acidity, resin. 86 points. ♦ Greco di Tufo, which balances floral, honeyed aromas with a bracing acidity, is one of several intriguing whites from Campania. On a recent visit, I sampled good examples from Mastroberardino and another giant of the region, I Feudi di San Gregorio, as well as from newer, smaller outfits like Pietracupa and Cantine dell’Angelo. ♦ Greco di Tufo is a mineral driven wine that reflects the ancient volcanic chain that makes up the soil in this area. It is a clean refreshing wine that needs to be consumed young. These wines need food as they contain a lot of natural acidity and are not high in “fruit” flavors. They have an almond like quality and some background notes of pears. Although historically a sweet wine, they are almost always vinified completely dry and make great parings with sea food or salads. The better producers include Mastroberardino, Feudi di san Gregorio, and Terredora. ♦ On the nose I found notes of melon, pineapple and candied citrus. This is fairly big mouthful of wine, but not at all overpowering. The flavors follow the nose. The texture is soft and unctuous with a very long round finish. ♦ Here’s a lovely Greco di Tufo with aromas of pressed flowers, peach and tropical fruit. The palate has structure and finesse, delivering ripe peach, apricot and pineapple flavors impeccably balanced by refreshing acidity. 88 points. ♦ Straw yellow in colour, this Donnachiara Greco di Tufo offers a subtle nose of melon and grapefruit before revealing a supple and medium bodied palate. Notes of melon lead as this Greco is tasted, with a typical chalky minerality emerging from the mid-palate. Hints of grapefruit carried over from the nose remain as this wine slowly fades. Overall this Donnachiara Greco di Tufo is a nicely balanced wine that show good typicity, even if the “X” factor required for a 90+ score is missing. 87 points. ♦ [Google-translated from Italian:] Pale straw and crystal clear. Nose extreme clarity and deep sipping some puffs of flowers and herbs. Mouth that starts quietly and then widens with inviting blend of flavors. Consistent closure and just warm. 85-87 points. 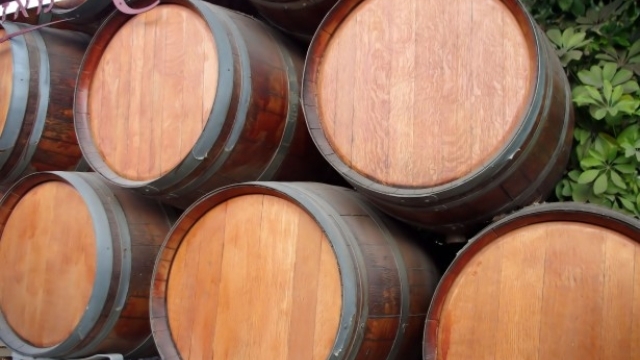 ♦ This is a wine that needs at least 5 or 6 years of bottle age before it is ready to drink, she [the winemaker] remarked. . The wine was just starting to come around [2010 vintage in 2014], it has nice citrus aromas and flavors, a hint of smoke and a touch of almonds in the finish and aftertaste. 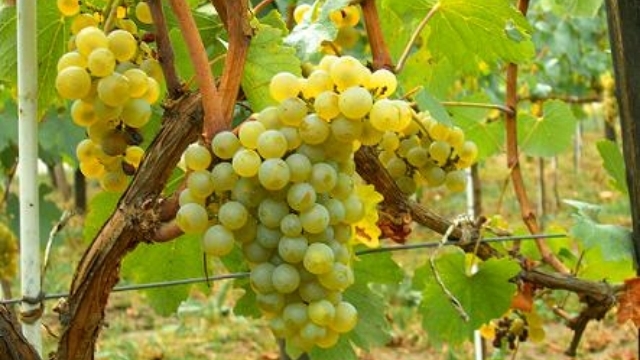 ♦ This ancient Greek grape generally produces a light, dry, nondescript white wine, but Donnachiara offers a more pronounced version that is made and aged exclusively in temperature-controlled stainless steel tanks. Both vintages [2010 & 2011] exhibited fresh and clean apple-like flavors with supporting acidity. The additional year of aging gave the 2010 more richness and body. ♦ Straw, yellow colour with an attractive fresh nose of herbs and flowers, some subtle green apple too. In the mouth it’s well integrated, balanced and harmonious. ♦ Donna Chiara’s 2008 Greco di Tufo was a treat for the senses as well with a lovely bouquet and a crisp, fresh finish. The price points bring their own special kind of joy. ♦ The soil is tuffaceous, the training system is Guyot and there are 3,300 plants per hectare. Fermentation for about 90 days in temperature controlled stainless steel tanks. The wine had flavors and aromas of citrus, pear and a hint of pineapple. ♦ [O]ne of Campania’s signature white wines, [it] conveys a stony, almost volcanic essence, which is not surprising since this grape grows well on Vesuvius’s soil. A tinge of bitterness in the finish buttressed by bracing acidity catapults this wine into the “easy-to-recommend” category because it’s a serious wine that delivers more than the price suggests. It’s perfectly balanced and piercing in an invigorating way, which makes it perfect for flavorful seafood. 91 points. ♦ [Google-translated from Italian:] In the straw-colored glass already loaded enough, with brilliant and greenish reflections. The bouquet is delicious and enveloping and offers citrus, green apple, apricot and/or exotic fruits, intertwined with sublime nuances of wildflowers and aromatic herbs. On the palate it flows a pleasant sip of freshness and softness, voluptuous for its sapidity and vivacity and also characterized by elegance, minerality and juicyness, leading to a dynamic and reactive grip. The mystic and endearing finale is totally fulfilling and persistent. To be kept six to seven years and over. ♦ Sight: Light straw yellow in color going to clear as it approaches the rim, or meniscus. Nose: Notes of apricot, green apples and minerality greet the nose initially. Further exploration yields a bit of a petrol sense and an extremely suddle smoke characteristic. Flavor: The flavors with this wine really confirm the nose. The minerality is right up front along with the tart green apples and petrol viscocity. This is a more full-bodie white wine that what you may be used to so don’t be surprised by the long lasting finish that goes along with it. Bottom Line: If you’re looking to break out of a varietal rut and want to try something you may have not tried before, the Nativ 2012 Greco di Tufo is a solid, well balanced, long lasting white wine option. ♦ The color is a deep yellow with an almost tan/almond rim. The wine is not at all oxidized, however. The attack is floral with fairly intense orange blossom and perfumed white flowers. The mid-palate is a bit nutty/almond. The mouthfeel is oily, like a Riesling, and likewise delivers a bit of a pungent diesel punch. Not a big wine and not a compelling wine. Nevertheless, it is an interesting wine…Recommended with reservations. ♦ Aromas of exotic fruit and apricot come with a whiff of hay and celery. The lean, simple palate offers nectarine and peach along with a note of bitter hazelnut. 86 points. ♦ Aromas of ripe orchard fruit, Mediterranean herb and toasted hazelnut lead the nose while the bright palate offers green pear, peach, unripe apricot and bitter almond. A mineral note signals the close. 89 points. ♦ [The wine] is straw yellow in color, medium- to full-bodied, and fruity. It is earthy and rich with loads of personality and distinguished aromas of peaches and apricots which just cascade across your tongue. It has zesty acidity and a lip-smacking, vibrant finish with a slightly bitter note reminiscent of almonds. Although regulations permit the inclusion of up to 15 percent non-Greco grapes in Greco di Tufo wines, Nova Serra is made entirely from Greco grapes.…Unlike many white wines, this wine will age well for another 7-8 years. Mastroberardino’s Nova Serra would still be a great wine buy at even double the price. ♦ [Google-translated from Italian:] The Nova Serra Greco of Tufo Docg 2013 took second place at Roots of the South, according to the opinion of the national jury. The wine has been worked in steel and glass for a few months. Alcoholicity of thirteen degrees. Chromatic effect in the glass of a straw-yellow slightly light and shiny. The nose reminiscent of apple, pear and peach, citrus, floral and vegetal essences, and typically local territorial olfactory presences. In the mouth the sip is fresh, sapphen, mineral, material, with fruity lines and slightly milder background. It also expresses an excellent tastiness vitality, played on a dynamic and slender evolution of the palate, suadente softness and elegant finesse. Pleasantly persistent and connoted by a slight note bitter the finale, which gives infinite enjoyment. Unbeatable price. 89 points. ♦ Quite fine: live and limber, but still deep and complex. 91 points. ♦ Dmitri raved about Mastroberardino's vineyard as we tasted one of its best known whites, Greco di Tufo Novaserra 2004, which has a Parker 87 and a Wine Spectator 90 rating. Greco di Tufo is a local noble grape that produces a full bodied, light amber white wine. The Benito Ferrara "Vigna Cicogna" Greco di Tufo is only a little higher rated than those in the list above, but then it only costs a little more.